COMMENT & ANALYSIS: Ahead of Bike Week next week the Road Safety Authority (RSA) are running a “Bike Week Survey” for people to cycle — but the survey is one of a number of recent indications that the quango doesn’t understand cycling safety or the collection of statistics. Bear with us, this isn’t about any one error in a question, but a few of them. And remember this is a body which can impact on road safety and policy around such issues, so it should have the highest standards for surveys and data collection. This is the first question, it’s not multiple choice. You can only be one type of ‘cyclist’. 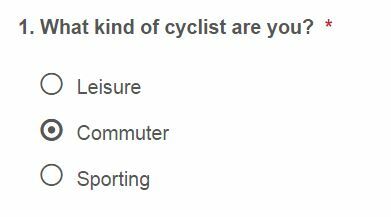 Even if they don’t want to make it multiple choice, a more relevant would be “In what way do you mainly cycle?”. This is another blunder. The questions will result in answers which look useful but are meaningless because they are so generalised. Busy roads in towns and cities can feel unsafe, just as busy roads in rural areas can feel unsafe. Quiter roads in both feel safer. Greenways in rural areas feel safe but so do decent segregated cycle paths. And yet another blunder — none of these are correct. The law states: “A pedal cyclist shall not drive a pedal cycle on a roadway in such a manner as to result in more than 2 pedal cyclists driving abreast, save when overtaking other pedal cyclists, and then only if to do so will not endanger, inconvenience or obstruct other traffic or pedestrians.” That’s not never, it’s not always, it’s not just on local roads and it’s not time-limited. Is this also another example of the RSA not referring to its own the Rules of the Road? 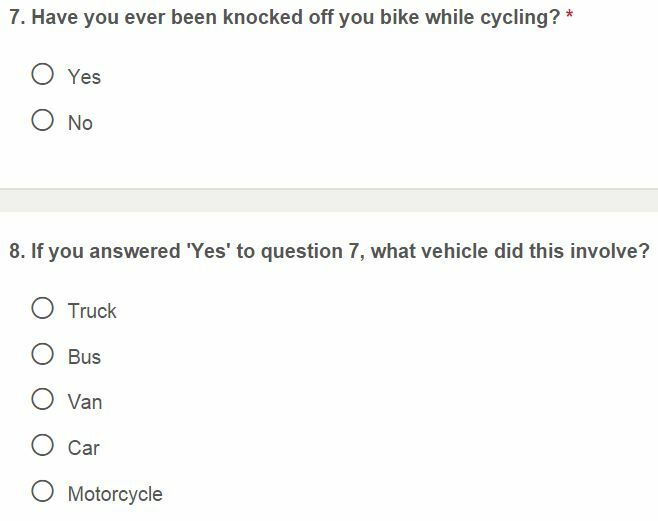 We answered yes to question 7, but then on the follow up question, they seem to be missing an option which many people who cycle in busy urban areas will be mindful of — pedestrians. Yes, we have — like many other people who have cycled in cities — been knocked off our bike by a jaywalking pedestrian. Witnessed by a garda and the perp was given an ASBO. Will there be fines for jaywalkers who endanger others any time soon? There is a problem here: I answered yes but my collision could be counted as a cycling-motorist collision, with motorists wrongly blamed. This question also does not account for people who have been in more than one collision (it should be multiple choice). Too much at the RSA is PR-driven. This clearly needs to change. Who created this survey ? Do they understand at all the needs of bicycle user ? Had to maintain the hiviz/helmet fetish of course. What is the biggest threat to safe cycling ? They didn’t even come close to touching on that. A victim blaming excercise as usual. Looks like they’ve been listening as the link to survey seems to be dead. The RSA takes so much time and effort telling us that cycling is not safe, and that we should wrap ourselves up in high-vis bubble-wrap, that it doesn’t have any resources left to look at the real problems faced by cyclists – such as bad road/junction design. That questionnaire is a painful read. Obviously the RSA has zero expertise in survey design. Are they pretending to be a research body? There is also a link to cycling tips on the website linked to bike week. Apparently cyclists should respect other road users by not getting into “shouting matches with motorists”! We should also never cycle on foot paths, no mention of exceptions such as cycle lanes on footpaths. Not to mention the usual guff about helmets and reflective clothing. Also no mention of using asl boxes, or giving space to parked cars, which are the kinds of tips people actually need to learn about. Good strong response to what seems like an ill thought out survey by RSA! Have they issued it widely or are they simply waiting for people to log on to website!? They have posted it on their Facebook page and also funded Facebook adverts for it (after seeing it first it also came up as a ‘sponcored’ post. The best advice I give to fellow cyclists is get a GoPro and put it on your helmet. The survey results that you will get on a daily basis will give you a real slice of reality. All we need is a repository that they can be uploaded to. Maybe the RSA should host the videos, now that would be useful, for a change and it would be a useful educating tool for them as well! I no longer see the RSA as fit for the purpose of increasing the modal-share towards cycling in order to attain the NCPF (2009) goal on a 10% national split by 2020. It has insisted on dangerising cycling to the extent that the public must be frightened to even consider cycling. If you are not lit up like a Christmas tree and swathed in body armour then keep off the road! It needs to refocus on the real and present danger faced by cyclists and that is the 1-3 tonne metal boxes being driven at inappropriate speeds by drivers who don’t understand or respect cycling, believing that because they pay motor tax their needs trump cyclists’ safety. Dangerous overtaking is simply being ignored by both the RSA and the Garda. Quite so, Mike. We need a Road Danger Reduction Agency. 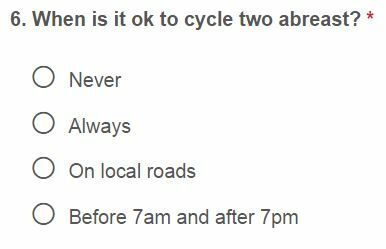 There is no problem with the answers re riding two abreast: it is always permitted, the very law you referred to says so.